I drive a small car, so when General Motors asked if I'd like to review the technology inside the 2016 GMC Sierra, I was ready. 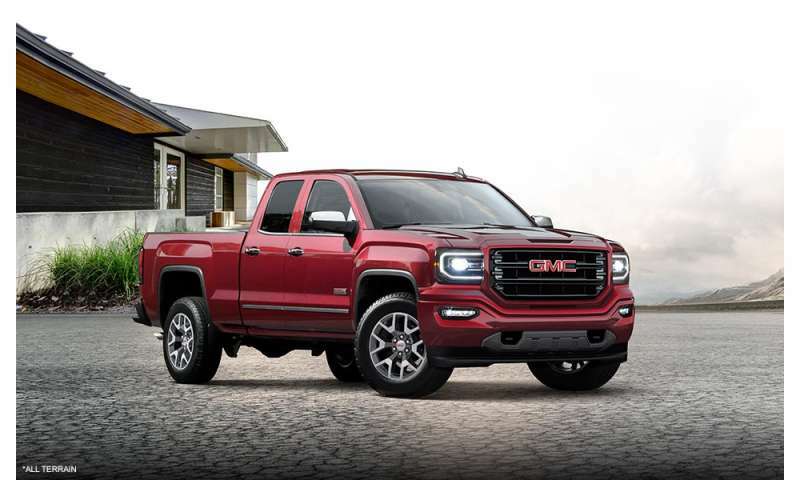 It is quite a jump from a Honda Fit to a Sierra SLT with the All Terrain X package, which is a crew cab (four-door) with a 5-foot-8 box and 18-inch wheels. The Sierra I drove was powered by a 5.3-liter V-8 with an eight-speed automatic transmission and had a sticker price of $56,695. The 2016 Sierra has a full-featured entertainment system behind an 8-inch touch screen that offers both Apple CarPlay and Android Auto, as well as GM's very capable Intellilink audio system powered by Bose. The radio has AM/FM/HD as well as SiriusXM and Pandora. But Pandora is a streaming service, you say? Why yes, it is, but the 2016 Sierra comes equipped with a built-in 4G LTE hotspot to provide Wi-Fi data for up to seven devices. The data plan's costs depend on the amount of data you'd like to stream and ranges from $15 per month for 1 gigabyte to $50 per month for 5 gigabytes. You can also activate the LTE data by the day ($5 for 250 megabytes) or just pay $150 for 10GB that can be used anytime during a year. The LTE data is part of the OnStar system, which has a separate cost of $199 to $349 per year. The $349 OnStar service plan includes 30 calling minutes each month, but I'm sure most people just use their own phones. The Intellilink system can connect to your smartphone via Bluetooth or with a USB cable. Once I paired a phone (both iPhone and Android), the Sierra's Bluetooth never failed to connect. When I connected using a USB cable, I was informed on the screen the Bluetooth was disconnecting and USB was taking over. Besides the radio and phone, the system has a capable navigation system that can tie into OnStar, as well as weather information including forecasts and radar maps. OnStar traffic information is also available. The Sierra has a wireless charging tray on the top of the console armrest for smartphones that are compatible with wireless charging. It worked perfectly on my Samsung Galaxy S7 Edge, but if the phone were in a case, it would not fit in the tray. The charging tray should be wider. The Intellilink system has a single-disc CD player in the dash under the screen. A few years back, Apple introduced CarPlay, which brings some of the iPhone's apps onto a vehicle's touch screen for use while driving. If you connect an iPhone or iPad to the system with a USB cable, a CarPlay icon appears on the screen. Launching CarPlay, the Sierra's screen displays the familiar iOS icons for phone, music, maps, messages, podcasts, audiobooks and other items. CarPlay will display all the apps on your iOS device that are compatible, which for me included MLB At Bat, Pandora, iHeartRadio, TuneIn and Spotify. The music icon played both my local music on the iPhone and Apple Music. Siri integration is a big part of CarPlay. Touching the phone or messages app brought up Siri to ask you who you'd like to call or message. You dictate the caller information or message so you can keep your hands on the wheel. All the phone funtions, including recent calls, contacts and voicemail, are available. The Siri dictation worked pretty well for me, but it wasn't perfect. I did like the Apple Maps navigation a bit better than the built-in system. This was my first experience with CarPlay, and I liked the functionality. GM just released the Android Auto update for the Intellilink system, and I like the interface a bit better than CarPlay's. Once the phone is plugged in and Android Auto is launched, the system icons are displayed across the bottom of the screen while the information is above, like on your Android phone. Google Maps navigation, telephone integration and music streaming are all available. I think it's interesting that Android Auto only works via USB cable, which also powers the phone. It competes with the wireless charging. You don't need to charge wirelessly if you're plugged in. I guess choices are a good thing. I love the amount of power ports and inputs around the interior of the Sierra. At the bottom of the center stack, there are two USB ports, two 12-volt power ports and a 120-volt AC plug. Inside the console are one more 12-volt power port, two more USB ports and an aux-in port. At the rear of the console is another 12-volt port for the back- seat passengers, which is nice, but I think for $56K, the back-seat passengers should have their own USB ports. I'm not entirely sure why the Sierra has a shark fin antenna on the roof and a traditional whip antenna on the fender. I suppose it's for better reception. I want to take this time to ask GM why they had to place the shark fin (satellite) antenna off-center on the left side of the roof, over the driver's head. Why can't they center the shark fin like every other manufacturer? I've always thought the off-center bump in the roofline looks silly. I've seen a lot of commercials recently about the 2016 Sierra that tout Bose's active noise canceling. I was hoping to try it out, but alas, that feature is only on the Denali version of the Sierra. I was pleased with the quietness of the ride of the Sierra All Terrain X, even with the 18-inch Goodyear DuraTrac tires. Some of the other tech goodies worth mentioning include park assist, rear-view camera, power sliding rear window, sunroof, LED headlamps and taillamps, stability control with trailer sway control and hill start assist, remote start, and power adjustable seats and pedals. The steering wheel has full controls for the information and entertainment system, and there's a small info screen in the center of the gauge cluster. The 2016 GMC Sierra was a fun truck to drive, and it had almost all the technology I could want in a vehicle. I was a bit surprised it still had a key and not push-button starting. And I did have to fish the key or the remote out to open the doors (no proximity door unlock), but it is a truck, after all. Bottom line: The entertainment choices in the Sierra are astounding.